Abu Muhammad ‘Ali Ibn Ahmad Ibn Sa’id Ibn HAZM, (November 994 to August 1064) grew up in the period of final collapse of Umayyad rule in Spain, as the nation disintegrated into often conflicting local states. 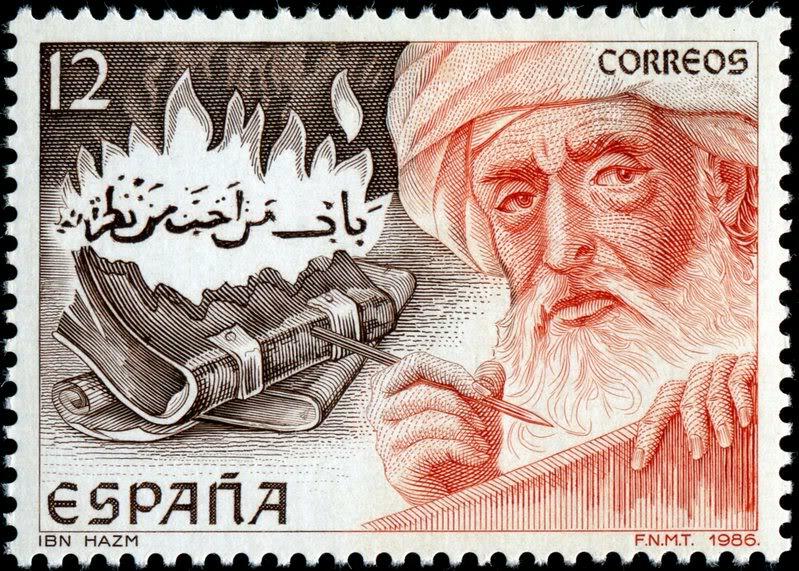 Abu Muhammad ‘Ali Ibn Ahmad Ibn Sa’id Ibn HAZM, (November 994 to August 1064) grew up in the period of final collapse of Umayyad rule in Spain, as the nation disintegrated into often conflicting local states. That period of turbulence and his early education by women, among whom he grew up, far from the company of other children, were to have profound effects on Ibn Hazm’s thought and character. 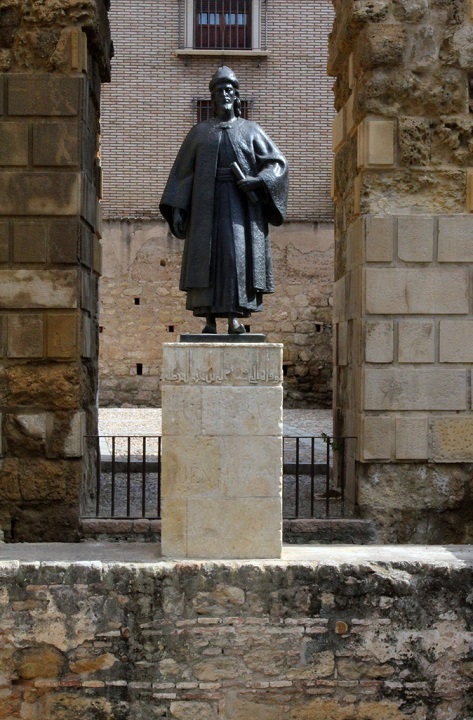 As a scholar, Ibn Hazm had a great reputation, and was one of the most original theologians and literati of Muslim Spain. He was a master of many disciplines, including history, grammar, poetry, genealogy, and logic, and wrote works of enduring importance in Islamic theology and law. He is the author of over 400 works, and was greatly respected for his ability to memorize both lines and random facts. Carra de Vaux though seems to give little recognition to Ibn Hazm, stating amongst others that his output although vast, was hardly devoid of errors. Ibn Hazm, however, in his Book of Introduction, Kitab al-Taqrib, which still survives, states that `science consists in knowing with certainty something according to what it really is, or by an evident proof which hence helps reach certitude’. This theme frequently occurs in his works. This paper seeks to look into this aspect as well as his philosophy and thoughts on science, its merits and its relationship to morals. Compare yourself, for wealth, status and health to those lower than you. For faith, science, and virtue, compare yourself to those who are higher than you." IBN HAZM, ABU MUHAMMAD 'ALl IBN AHMAD IBN SA'ID was born in November 994, and died in August 1064. The Ibn Hazm family came from the city of Cordoba itself. Their earlier origins are much less clear, although evidence shows that they were of indigenous Iberian stock from Labla, west of Seville, a few miles from the Atlantic shores. One of the ancestors of Ibn Hazm converted to Islam from Christianity. Ibn Hazm's father, Abu 'Umar Ahmad ibn Sa'id ibn Hazm (d. 1012) held the office of vizier (Minister) at the court of al-Mansur. Al-Mansur’s reign had been one of the high points of Islamic Spanish history. Al-Mansur had enriched the kingdom economically and financially, and had led Muslim armies to victories of unprecedented scale against their Christian foes. However, at his death (in 1002), ridden with intrigues, divisions, and conflict between numerous factions, the once most powerful state collapsed into chaos, and was never to recover. Aware of, and also part of such disintegration, Christian armies seized their chance to carve up the Islamic dominion. This, they would gradually achieve, although the Almoravid, and then the Almohad arrivals slowed the Christian advance by about two centuries. Early in the thirteenth, after the final defeat of the Almohads at Las Navas de la Tolosa in 1212, Cordova (1236), Valencia (1238), Seville (1248), and other Islamic strongholds all fell. Granada alone was to remain Muslim, until, it too, ridden with intrigues and divisions, finally fell in 1492. The Muslims, and their descendants, were to be completely eliminated from Spanish soil not long after (in 1609-1610). 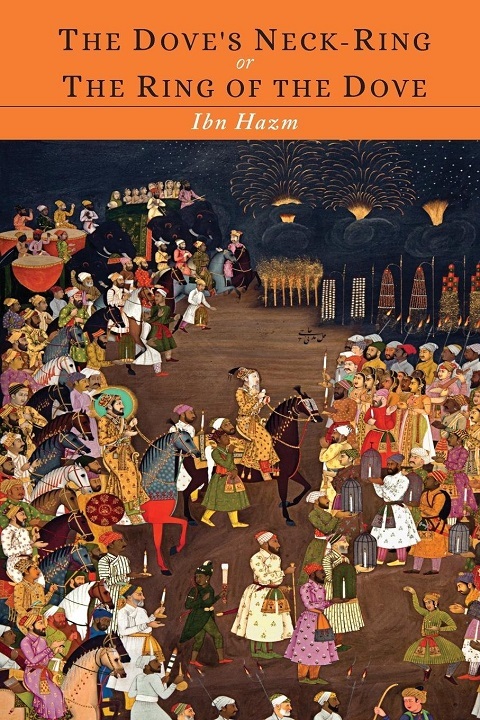 The life, and thought of Ibn Hazm are both good illustrations of and product of the chaos and collapse of the Muslim state. The collapse had a direct impact on Ibn Hazm who was at the center of events. He held positions of power and prestige, followed by failure and disgrace according to the political fortunes or misfortunes of his patrons. In 1016, for instance, Caliph Sulayman was overthrown, and Ibn Hazm, suspect for his Umayyad sympathies, was first imprisoned and then banished. Three years later, he returned to Cordoba, and four years after became the vizier of 'Abd al-Rahman V, whose rule, though, only lasted for seven weeks before he was assassinated, and Ibn Hazm was again put in prison. Ibn Hazm, who had already been terribly affected by the demise of his own father before him, following earlier upheavals, now suffered even more and directly from the effects of political chaos. That may account for his acerbic and harsh temperament, which made him both famous and feared for his sharp tongue, and it became well known that "The tongue of Ibn Hazm and the sword of al-Hajjaj ibn Yusuf [the severe Umayyad governor of Iraq] are brothers.’ The upheavals of his political career may also account for Ibn Hazm’s withdrawal from public life to devote himself to study, teaching, and writing. 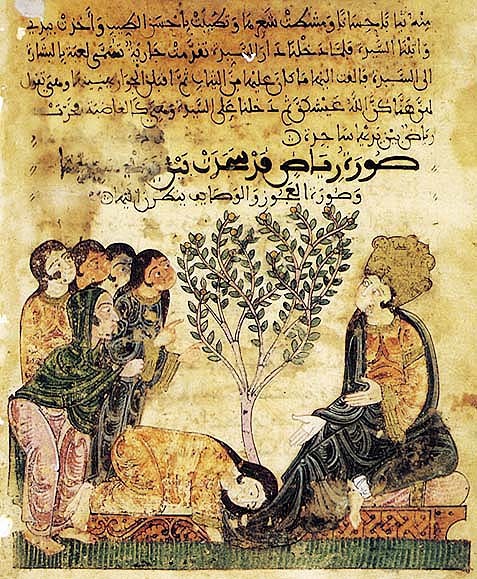 For Asin Palacios, however, much influence on Ibn Hazm’s character and writing was the result of his education by women as he grew up in his father’s harem, isolated from children of his own age and from men, which shaped his personality considerably. 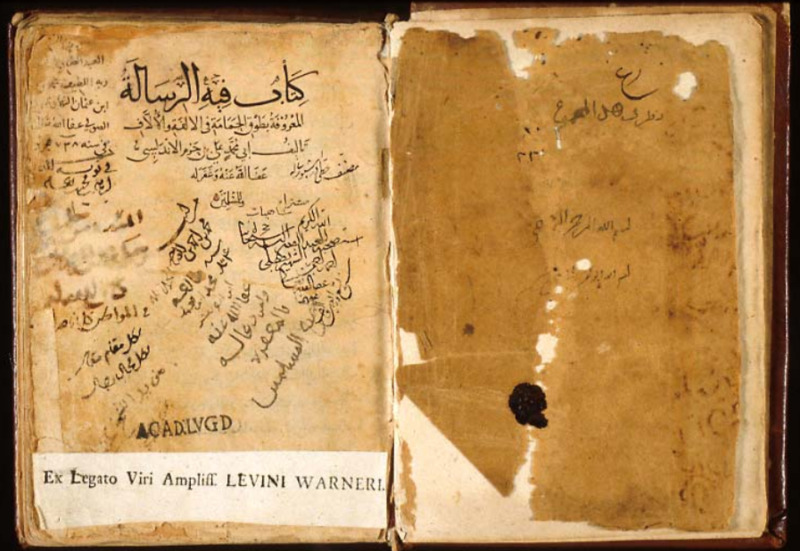 According to Yaqut and Al-Qifti, two of the main Muslim biographers, Ibn Hazm wrote nearly four hundred works, amounting to nearly 80,000 pages. -Kitab al-Ihkam fi usul al-Ahkam (of the perfect knowledge of the foundations of jurisprudence). 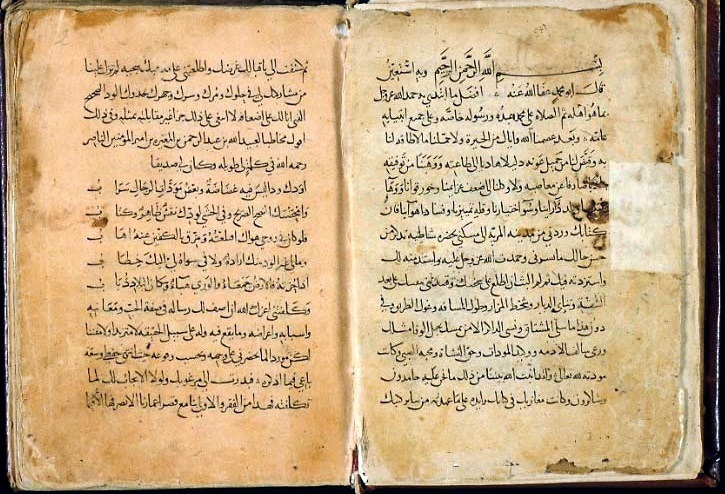 The manuscript can be found in the National Library of Cairo, where it has been edited in two vols. 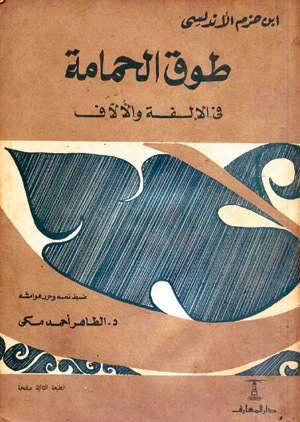 -Kitab jamharat al-Arab (on the Arab genealogy), known through the Cairo critical edition made by Levi Provencal in 1948. -Risala fi fadl al-Andalus wa dikr rijaliha (a letter on the merits of al-Andalus and the memory of its men) which was kept by al-Maqqari in his Nifh al-Tib (vol 4). -Kitab al-Akhlak wa’l siyar (The book of morals and behaviour): edited for the first time in 1908, although cited by Yaqut and al-Maqqari. The manuscript was discovered by Dr Ritter alongside other works. -Al-Dabbi: Bughyat al-Multamis. Madrid 1885. -Hajji Khalifa: Kesf al-zounoun edt. Constantinople, 1941. -Ibn Bashkuwal: Kitab as-Sila; Madrid, 1882-3. -Ibn Khallikan: Wafayat al-a’yan. Cairo, 1275 H.
-Ibn Qasim B.Said: Tabaqqat al-Umam. Ed. L. Cheikho. Beirut; 1902. -A-Marrakushi: Histoire des Almohades. Trad. Fagnan; Algiers, 1893. -Yaqut al-Hamawi: Mou’jam al-Oddaba; Edt Rifai Bey; Cairo; Vol Xii…. Today, the literature on Ibn Hazm in English is rather scanty. There is a good entry on him in the Encyclopedia of Islam by Arnaldez. But Arnaldez, like many with an interest in Ibn Hazm, writes in French. The main work of Ibn Hazm that has retained the attention of English speaking scholarship is Tawq al-Hamama translated by A.J. Arbery, London 1953. Otherwise, most information on Ibn Hazm is gleaned from French sources, and of course, Spanish sources. Asin Palacios, more than any other, has written at length, most particularly his well known, and lengthy: Abenhazem de Cordoba. Arnaldez compared Ibn Hazm and the French philosopher-rationalist, Descartes. Perhaps more appropriately, comparisons should have been drawn between Ibn Hazm and the other French philosopher-scientist: Pascal (1623-62). Indeed, like Ibn Hazm, Pascal was both scientist, and also highly imbued with faith, at every step seeking to reconcile them, the moral aspect of each issue always imposing itself in the end. Moreover, Pascal, in his work, Les Pensees (Thoughts) (de Pascal) also seeks to order his thoughts, a sort of listing found in Ibn Hazm, whereby each thought carries a function, and conveys a specific injuction, or idea. All thoughts are related, coherently assembled in batches, and all aiming at one and the same end: the cohabitation, or the working together of science and high, God inspired morality. 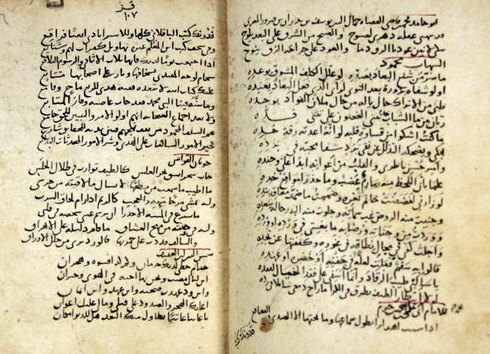 Ibn Hazm’s most extensive philosophy and thoughts on science are to be garnered from his Kitab al-Akhlaq wa’l siyar which was translated into French under UNESCO sponsorship by N. Tomiche, and which is used here as a source of reference. 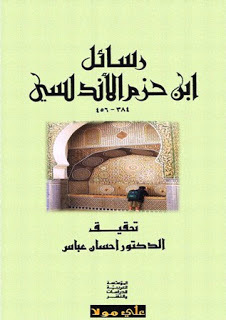 Figure 6: Front covers of two Arabic editions of Ibn Hazm's works: Tawq al-Hamama (left) and Rasa'il ibn Hazm (Right). If you attended (a study session) strictly adopt three attitudes; there is no fourth. First: You can lock yourself in the silence of ignorance. Second: If you do not behave as such, ask for the questions a man seeking to learn asks…. This man will ask only about what he does not know, not about what he knows. Asking about matters one knows is making proof of ineptitude; this is only ranting, waste of time for everyone…. 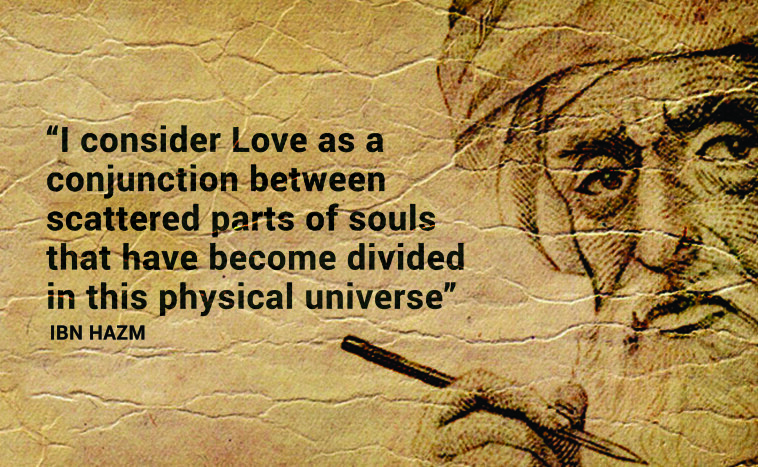 Ibn Hazm’s thoughts and philosophy on science have also another dimension. It is common with Islamic scholars, such as Al-Ghazali, to classify sciences, to provide some sort of division that helps in their understanding, study and promotion. This division, gradually has led to our modern learning system in departments, faculties, and courses (Prior to the Muslim classifications, sciences were a bulk of knowledge, somehow like the precious stone mingled with rough metals, and earth. Indeed, there were no boundaries and it was thus easy to find the chemist dabbling with the magician, and the philosopher. It was extremely hard to stop one side, the non scientific taking over the scientific, and the science often stagnated, or diverted into inappropriate directions because of that). Ibn Hazm did not make the classification of sciences as such. Instead, he provided the boundaries, and the rules within science as a whole. He brings in all dimensions looked at above. He does, moreover, which is quite important, provide the seeker of science with indications of how to go on about it, integrating the highly complex, abstract, moral and also the most down to earth, such as the prudent conduct in scientific gatherings. On geometry, again like Pythagoreans, he defines the line, ‘as the ultimate edge of any surface ad defined a point as the crossing between two lines.’ Al-Taqreeb p. 47. He also commented on the concept of infinity or the limitless and the limited. In Al-Taqreeb p. 128, he refers to the universe as limited and bounded, because it was created and because the universe is made of limited parts, it will follow that, it will also be limited. He also refers to the present objects and living creatures and plants, as limited, yet the ones which have not yet been created (such as humans who are not yet born) are unlimited. we Muslims do not have definite knowledge yet of the age of the Earth. It could be many multiples of the ages suggested by others." Ibn Hazm did not seem to know about the discoveries of Ibn Al-Haytham, (b. 965-1039). Ibn Hazm was nearly 40 years when Ibn Al-Haytham died, yet he still believed in the old Greek understanding of vision in that, the eye produces rays which illuminate the object which make it visible. Communications of learning at the time was slower, most particularly in times of turbulence, as in Spain. Ibn Hazm’s view on sound is that it travels at specific speeds. He gave examples to prove this, including reference to the interval between lightening and the thunder that follows it. In this, he implicitly believes that lightening causes thunder. Ibn Hazm expresses views on the development of life and species. He classified them into categories according to the process of their inception and development. He goes into details of various insects (such as lice and flies) and animals (such as frogs). Much of Ibn Hazm’s work (400 nearly 80,000 pages) is still un-translated from Arabic. Although there are numerous Spanish and French translations of some of his books, there are very few into English. Analdez, likened Ibn Hazm to the French philosopher-rationalist, Descartes. Perhaps more appropriately, comparisons should have been drawn between Ibn Hazm and the other French philosopher-scientist: Pascal (1623-62): the cohabitation, or the working together of science and high, God inspired morality. Ibn Hazm’s thoughts and philosophy on science have also another dimension. 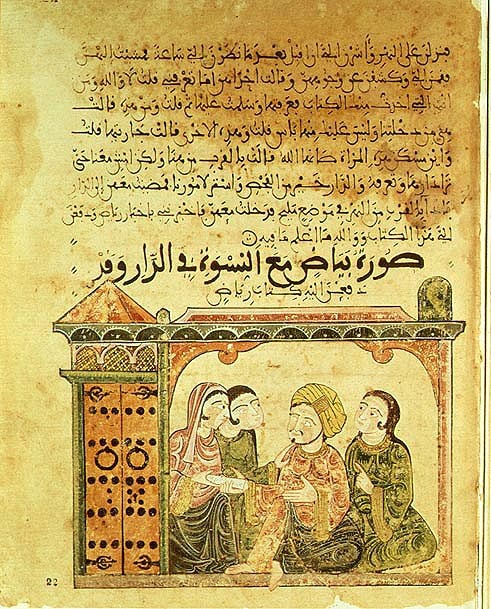 It is common with later Islamic scholars, such as Al-Ghazali, in classifying sciences, to assist in their understanding and promotion. He drew the boundaries, and the rules within science as a whole. He moreover, which is quite important, provided the learner with indications of how to go about it, integrating the highly complex, abstract, moral and also the most down to earth, such as the correct behaviour at a scientific gathering. This classification, gradually perfected has led to our modern learning system. Any scholar, imbued with science, often at odds with themselves, and the hows, and above all the whys of their science, has to return to Ibn Hazm. R. Arnaldez: Grammaire et Theologie chez Ibn Hazm de Cordoue; Doctoral Thesis, Paris; Librairie Philosophique J.Vrin; 1956. M. Asin in Al-Andalus; 1939; Vol IV; p. 278. M. Asin Palacios: Abenhazam de Cordoba, 5 Vols, Madrid.1927. Baron Carra de Vaux: Les Penseurs de l’Islam. Vol. 3. Paris, Geuthner, 1922. A. Castro: The Structure of Spanish History; Tr., by E. King. Princeton University Press; 1954. Ibn Hazm: Kitab al-fisal fi'l-milal wa-l-ahwa wa-l-nihal, 5 parts in two vols; Cairo, 1899 and 1903; vol I.
N. Tomiche: Epitre Morale, Collection UNESCO, Beirut, 1961. Baron Carra de Vaux: Les Penseurs de l’Islam. Vol. 3. Paris, Geuthner, 1922; at p. 333. Philosophique J.Vrin; 1956; at p. 105. M. Asin Palacios in Al-Andalus; 1939; IV; p. 278. Trsltd by N. Tomiche under the title: Epitre Morale, Collection UNESCO, Beyrouth, 1961, p. 21. Dictionary of the Middle Ages, op cit; at p. 117. M.Asin Palacios: Abenhazam de Cordoba; 5 vols; Madrid, 1927. Vol 1. R.Arnaldez; Grammaire, op cit, Introduction p. 1. Dictionary of the Midde Ages, op cit, p. 117. A.Castro: The Structure of Spanish History; Trsltd by E. King. Princeton University Press; 1954; p. 140. Baron Carra de Vaux: Les Penseurs de l’Islam. Vol 3. Paris, Geuthner, 1922, at p. 333.